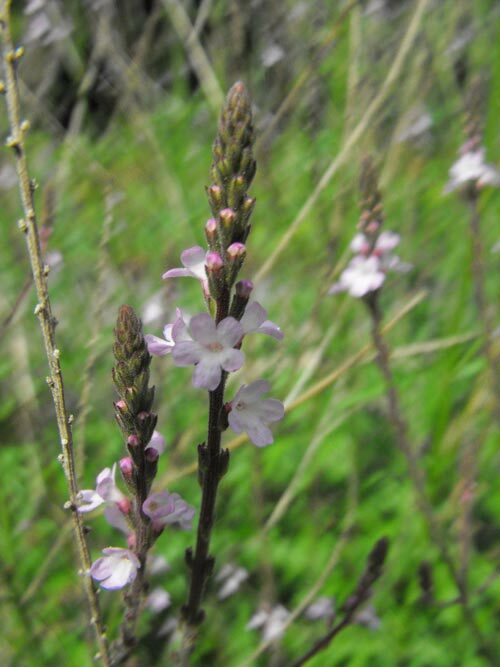 Vervain flower remedy is made from the flowers of Verbena officinalis which has a long history as a medicinal herb. Of all the Bach Flower Remedy plants we’ve grown from seed Vervain has been the most prolific, growing over-enthusiastically in tray after tray! This over-enthusiasm is the key to how vervain flower remedy is used. Vervain flower remedy is for people who want to convert others to their ideals and won’t stop until they’ve done so. They try to enthuse others with their passion; often overwork, can’t switch off and subsequently become tense and burnt out. Vervain flower remedy brings balance so if you find it difficult to switch off, vervain will help you to let go and relax more easily. We’ve planted it all over the site – partly because we had so much of it and partly because it’s notable for attracting wildlife.